This recording of Missa Paschalis and Litaniae Omnium Sanctorum contributes to the remarkable renaissance over the past decades of the music of Jan Dismas Zelenka (1679–1745), the Bohemian musician who came to Dresden to serve at the courts of Saxon Electors and Kings of Poland: August II and, from 1733, August III. 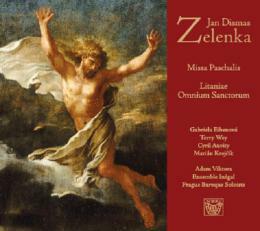 This recording of Missa Paschalis and Litaniae Omnium Sanctorum contributes to the remarkable renaissance over the past decades of the music of Jan Dismas Zelenka (1679–1745), the Bohemian musician who came to Dresden to serve at the courts of Saxon Electors and Kings of Poland: August II and, from 1733, August III. It was the devout Habsburg wife of August III, however, who appears to have wielded the great influence upon the quality of music composed and performed in Dresden’s royal Catholic court church. Throughout her life in Dresden, Maria Josepha took an active interest in this aspect of worship, requesting the elevation of certain feasts through the composition and performance of sacred music. For exequies, in particular, this queen specifically requested Zelenka to take charge of the music on many occasions. When the castrati of Dresden’s renowned Hofkapelle baulked at singing for certain services of the church, it was she who resolved the impasse. For example, when they claimed that they were not obliged to sing the requiem mass on 3 November 1733 (the anniversary of the dead members of the Society of Jesus: Anniversarium omnium in Societate Defunctorum) the Diarium Missionis Societatis Jesu Dresda kept by the Dresden Jesuits who staffed the royal chapel reported that representation was made to the queen, who immediately ordered the requiem mass to be sung by these singers, and was herself present in the chapel. These two large-scale works by Zelenka were composed at key moments of his life. Missa Paschalis (ZWV 7) comes from the year 1726 when he appears to have begun to aspire to a position at the Dresden court as a composer rather than one of performer: Litaniae Omnium Sanctorum (ZWV 53) was almost certainly written in 1735 soon after this ambition had been realised. Moreover, these two works are among the many sources that go a long way towards negating the popular impression that Zelenka’s music was unappreciated during his lifetime and never heard after his death. On the contrary, sources kept outside Dresden of both Missa Paschalis and Litaniae Omnium Sanctorum reveal that Zelenka’s music lived on into the nineteenth century – well after his death. On 17 January 1726, the year in which Missa Paschalis was composed, Zelenka began to keep an inventory (Inventarium rerum Musicarum Variorum Authorum Ecclesiae servientium) – his personal record of his own compositions and music he had collected. Despite Zelenka’s optimism that is obvious in this undertaking, during 1726 the uninterrupted growth of the Dresden Catholic court church was checked. ‘A black year for the calamitous upheavals it brought’, is among the opening statements of the annual letter to Rome written by Father Hartmann SJ, the Superior of the Jesuits in Dresden. Organizational problems experienced by these Jesuits early in 1726 were relatively minor compared with the brutal murder on 21 May of the deacon of Dresden’s Lutheran Kreuzkirche by a deranged member of the king’s bodyguard. This crime (rumoured to have been inspired by the Jesuits) led to rioting in Dresden, the rounding up of Catholics, attacks on their dwellings, on the Jesuit house, and on the royal chapel itself. Many Catholics fled to neighbouring Bohemia at this time, including two royal musicians, while others in the service of the church and the court were given refuge in royal buildings. Against these difficulties and the violence that loomed, Zelenka set at least two Vespers psalms: Beatus vir (ZWV 76) dated ‘Dresda 11 Marti 1726’ and Dixit Dominus (ZWV 68) dated ‘Dresda 1726 li 23 Marz’. He was also composing the Missa Paschalis (ZWV 7), a work performed on Easter Monday, 22 April. Two dates are written into the score: ‘Dresd: li 30 Marzo 1726’ at the conclusion of the Kyrie, and ‘Dresdae li 11 April 1726’ at the end of the Gloria. We are fortunate that contemporary Jesuit documents refer to the music performed in the royal chapel for Eastertide 1726. From entries into the Diarium we know that on Easter Sunday (21 April) Kapellmeister Johann David Heinichen (1683–1729) was responsible for the music performed by the royal musicians. On the following day, it was recorded that at 10.30 am there was a sung mass ‘with assistance’. The music was by Zelenka. A note bene in the Diarum reported that throughout these days – Easter Sunday, Monday and Tuesday – trumpets and timpani were heard, as well as during the Resurrection ceremonies which had taken place on the previous Saturday evening. Without doubt, Zelenka’s Missa Paschalis, whose scoring includes four trumpets and timpani, was the mass performed on Easter Monday 1726. Missa Paschalis is a relatively early example from Zelenka of a complete solemn mass. It follows the pattern for mass settings established in Naples and emulated in Venice, as well as by composers of the Habsburg Lands and of German-speaking courts. In these ‘number’ settings a mixture of old and new musical styles was employed. Large-scale choruses, often with vocal concertante writing for solo singers pitted against the chorus, are heard accompanied by an orchestra that could be organised along concertante and ripieno principles. These sit side by side with choruses composed in the a cappella style. As a contrast, solo vocal arias, usually with obbligato accompaniment, are interspersed. The text of the Gloria of the mass, ‘Qui tollis peccata mundi’ was sometimes composed (especially by Zelenka) as a dramatic ‘Szene’ where contrasting tempi, great pauses, daring harmonies, and special orchestral effects are heard. In Missa Paschalis Zelenka specified a tremolo to be played in the upper strings at the final appearance of the word ‘Miserere’ in the movement ‘Qui tollis peccata mundi’. Repetitions of movements create great musical arches. Thus, in Missa Paschalis, ‘Kyrie II’ is a repetition of ‘Kyrie I’; the ‘Amen’ of the Credo brings back the ‘Amen’ from the Gloria; ‘Dona nobis pacem’ is yet another repeat of ‘Kyrie I’. Interestingly, examination of the autograph score shows that at some stage after 1726 – almost certainly during the early 1730s when he had taken over the duties of the deceased Kapellmeister Heinichen – Zelenka re-worked final sections of Missa Paschalis. It is clear that he remodeled the conclusion of the ‘Osanna’ and he inserted the beautiful ‘Benedictus’ setting for solo soprano. (This can be seen from changes to his notation that took place in and around late 1728). Whether an earlier setting of this movement was replaced, or a new one was added is not known. (The omission of a musical setting of the Benedictus was a trait of Roman and Bolognese mass settings). Zelenka did not specify which instrument (or instruments) should play the obbligato to accompany the solo singer in this later inserted movement in A major. Possibilities included the use of a solo violin, the entire violin section, or a solo flute. (In this recorded performance both flute and violins are used). The answer to this question would be found in the thirty parts (now missing) that once accompanied the score which today is held at the Saxon State and University Library (Sächsische Landesbibliothek, Staats- und Universitätsbibliothek Dresden). During the eighteenth century Zelenka’s Missa Paschalis was among the most widely circulated of his masses. Among these examples is a manuscript copy (without Benedictus and Agnus Dei) kept in Berlin. It is written in the hand of Johann Gottlob Harrer (1703–1755), a student of Zelenka and J. S. Bach‘s successor in Leipzig. This is one of two copies from the Berlin Sing-Akademie returned to Berlin from The Ukraine in recent times. While nineteenth- and twentieth-century copies exist in The Czech Republic, a near-contemporary example with reduced scoring and without the ‘Benedictus’ and ‘Agnus Dei’ was copied circa 1750 by Sebastian Böhm from Mìlník. This copy is held today in the Prague Museum of Czech Music, Historical Department, while a manuscript copy once held at Tenbury (also without the Benedictus and Agnus Dei) is kept in the Bodleian Library, Oxford. The Jesuit Diarium from Dresden provides a very strong hint about the origins of Zelenka’s Litaniae Omnium Sanctorum. His musical setting of this extensive text is the only example of the oldest of all litanies held among the hundreds of sacred compositions listed in the Catalogo of Dresden royal chapel’s music collection when it was assembled in 1765. Yet although the saying or singing of this litany is often reported in the Diarium, it is especially associated with the final stages of Maria Josepha’s pregnancies when special three-day devotions were held for her. For example, on 11 August 1730, preceding the birth of Saxon Prince Xavier (25 August 1730), the Diarium reported that at 11 am there were two low masses and the Litaniae Omnium Sanctorum. [‘Hora 11 duo sacra lecta. In choro Litaniae de Omnibus Sanctis’]. It does seem as though before 1735 this would have been a simple setting performed by the choristers of the Catholic court church, the Kapellknaben (who, except for six kept on to serve at the altar, were dismissed in mid 1733 and their role in the church was taken over by the castrati of the Hofkapelle). On 30 January 1735, however, when Maria Josepha was in Poland, the Diarium reported that three days of prayer for the queen’s successful delivery had begun. This was Maria Josepha’s first pregnancy following her coronation as Queen of Poland. At 11 am, two masses were said in the presence of the Exposed Blessed Sacrament during which the Litaniae Omnium Sanctorum, newly composed by Zelenka, were sung in the choir. (‘Hora 11 dictae sunt duae missae coram exposito Venerabili, sub quibus in choro cantantur Litaniae de OO.SS. quas novas composuit D. Zelenka’). Why then, was this composition not available for performance in the coming months? On 25 April 1735 (Feast of St Mark) the Diarium reported that previously the Litanies of All Saints had been sung ‘in choro’, but ever since the royal musicians (that is, the castrati) had been given this responsibility, these litanies had been omitted – the reason being that they didn’t have a composed setting of the Litanies of All Saints, or other frivolous excuses. (‘Aliis annis decantatae sunt Litaniae de OO.SS. in choro. Sed a quo Orchestra Regia habet musicam, omissae sunt, sicut multa alia, causantes se non habere compositas, vel habere catarrhum, etc. frivolae excusationes!’). (organ, violoncellos, violones, bassoons and, perhaps, tiorba). ‘Kyrie eleison’ is introduced by a homophonic choral block set against a swirling string accompaniment which leads into a double fugue on the texts ‘Kyrie eleison’ and ‘Christe eleison’. To those several compositional mannerisms that belong to him alone (these are sometimes referred to as ‘Zelenkisms’), new developments took place in the early 1730s. These are heard in those glorious solo and ensemble arias in triple metres with slow moving harmonies, prodigious use of varied articulations, a wide range of dynamics, and obligatory ornaments written into the uppermost orchestral and solo vocal parts (including the Scotch snap, otherwise known as Lombardic rhythm). These new characteristics represent the stile galante, and they especially are evident in the solo and solo ensemble movements ‘Pater de coelis’ (No. 2), the tenor aria ‘Ab ira tua’ (no. 5), and the aria for soprano, alto, and bass ‘Ut nos ad veram’ (No. 7). With the introduction of these galant elements, Zelenka’s personal musical style was taken to a new level. There can be little doubt that this new influence at work in Dresden and on Zelenka came with the arrival in 1731 of Johann Adolph Hasse (1699–1783) to direct his opera Cleofide. Moreover, he was writing for a group of young castrati who had been trained in Italy for the revival of the Dresden opera. The length of the text of this litany necessitates elision, especially in the third movement, ‘Sancte Petri’, where the call for intercession of disciples, apostles, evangelists, holy martyrs and doctors, bishops and confessors, priests and levites, monks and hermits, virgins and widows, is wonderfully unified through Zelenka’s use of chant material first in the soprano part, followed by alto, tenor, bass, and concluding with a repetition in the soprano. The solo or ensemble arias that follow are separated by relatively brief choral movements. ‘Propitius esto’ (No. 4) is set as a short homophonic chorus. The tremolo accompaniment used throughout this movement highlights the pleas for mercy, while the sixth movement ‘Peccatores te rogamus’ is set for voices which, in this recording, are supported by organ alone. Zelenka’s autograph score of Litaniae Omnium Sanctorum is today missing from Dresden. In the eighteenth century the work was entered into a now-incomplete royal music inventory that almost certainly was the catalogue of Maria Josepha’s music collection, an inventory assembled in the first half of the 1740s. There, Zelenka’s Litaniae Omnium Sanctorum is the fourth of nine listings under the title ‘Musica di Chiesa di varii Autori’. (The first listing in this collection is Bach’s ‘Missa â 18 voc.’, that is, the Kyrie and Gloria of his Mass in B Minor: BWV 212/1). This must have been a presentation copy with a dedication to the queen. A score of this work, together with an unknown number of parts, was also listed into catalogues of the Dresden Catholic court church, 1765 and circa 1784, thereby hinting that two score copies of this work (one would certainly have been an autograph) once were in existence. Fortunately, nineteenth-century copies of Litaniae Omnium Sanctorum exist in Prague. One example is kept today in the archive of the Prague Conservatory. It bears the stamp ‘Verein der Kunstfreunde der Kirchenmusik in Böhmen’, and carries a dedication from Ferdinand Mende, an organist and teacher who worked in Dresden between 1822 and 1844. Another nineteenth-century source of this work from circa 1850 is held today in the Historical Department of the Museum of Czech Music.